Fantastic Friday: I married a what now? Reading the Fantastic Four comics from the start. 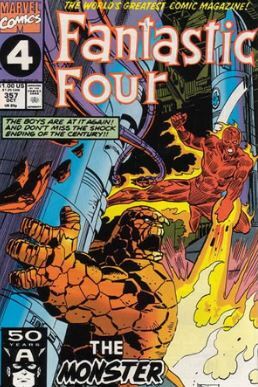 Writer-editor Tom DeFalco came to the series with a mission of undoing all the changes of the ‘70s and ‘80s, resetting the series back to how it was during the Lee/Kirby years. That means finding a way to undo not just Johnny and Alicia’s marriage, but their entire relationship. That brings us to the big reveal in issue #357. 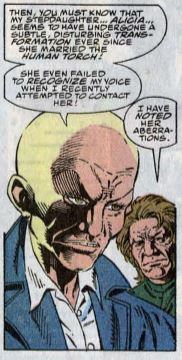 The issue begins with Reed in his lab, just having invented a “brain-patternizer.” He says this device will protect the FF from mind-controlling villains such as the Puppet Master. Our heroes testing out this device makes for a pretty weak excuse-for-the-characters-to-show-off-their-powers-for-a-few-pages thing. 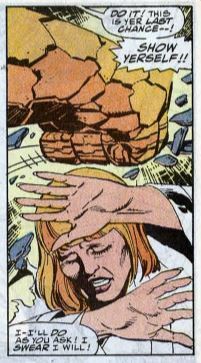 Alicia (who, as we’re about to learn, is secretly Lyja the Skrull in disguise) walks into the lab, and she refuses to be hooked up to the machine. We then visit the Vault, a special prison in Colorado built for superhuman criminals — basically Marvel’s equivalent of Arkham Asylum. There, the Mad Thinker is locked up. Except not really, because he mentally projects his consciousness into an artificial body of his, located in his secret Manhattan lab. There, he can conduct crimes with a perfect alibi. He meets with the Puppet Master, who says he desperate for help. Puppet Master says his daughter Alicia has undergone a “transformation” since marrying Johnny. Mad Thinker says the solution is to destroy the FF, but then his computers announce that the FF are already as good as dead. At an art gallery, Alicia/Lyja learns her newer, abstract sculptures aren’t selling as well as her earlier lifelike work. Outside, Johnny flirts with some pretty girls before having to admit to them that he’s married. He later has a heart-to-heart with Sue, saying he never realized how much work went into marriage. Sue wants to talk to Reed about this, but he’s concerned about one of the brain readings he took earlier. There’s a short scene with the Puppet Master reviewing the Mad Thinker’s findings, saying, “They can’t be true! And yet… they explain everything!” Back at FF HQ, Ben is making a late-night sandwich when he hears noise coming from Reed’s lab. He finds a stranger in there, whom we only see in silhouette. The stranger is able to shape-shift into a bird-like form and then a snake-like form before escaping from Ben. The rest of the FF can’t find any sign of an intruder, with Johnny and Franklin joking that Ben might have dreamed the whole thing. Reed, however, believes the answer lies in his brain-patternizer device. Ben goes for a light-night walk out in the city, where Puppet Master finds him. Puppet Master says they share common ground in their love of Alicia. At HQ, Alicia/Lyja tells Johnny that she suspects Puppet Master is the one who infiltrated the building. She then says she has something important to say to Johnny. They’re interrupted by Ben and Puppet Master, who come crashing through the wall. Ben says he’s going to kill Alicia. Fade out: Sue says she is “deeply offended” by Alicia/Lyja doesn’t want Reed to mess with her brain. Clobberin’ time: Ben’s wacky sandwich recipe includes hot peppers, sardines, peanut butter, and pickled beets. 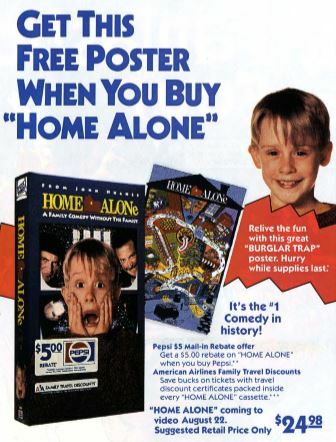 He then says he’s going to enjoy the sandwich while watching The Rocketeer on VHS. 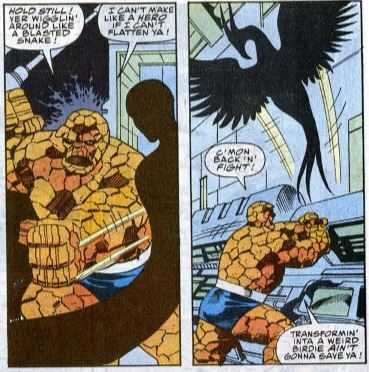 Flame on: Ben is able to defeat Johnny in their fight by using all of the fireproof devices in the building, including ripping up the fireproof carpeting and wrapping Johnny in it. Four and a half: Has Franklin been de-aged? When we last saw him in Power Pack, he started attending school (first grade, I think, but can’t find a real confirmation) alongside Katie Power. Here, however, he seems written and drawn more preschool-y. The Alicia problem: The foreshadowing of the Alicia/Lyja reveal is laid on really thick, with a sense that the noose is tightening around Lyja, so she knows she’s on the verge of being caught. Trivia time: The Iron Man-like guard the Vault isn’t identified. He’s the Guardsman, using technology adapted from Iron Man’s armor. The most well-known prisoner of the vault was Venom, who escaped on multiple occasions. The Avengers were also locked up there when they were falsely accused of treason. 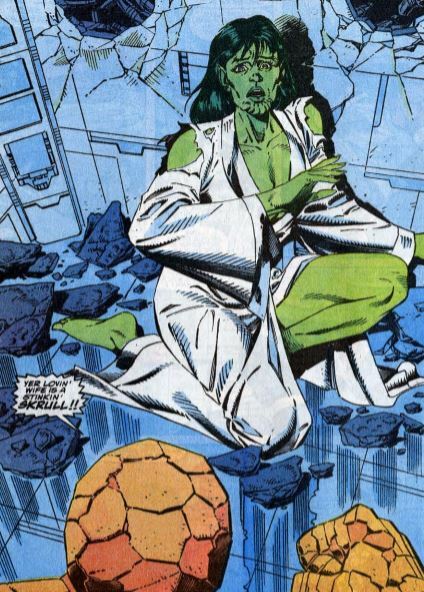 The Vault was later replaced by the oceanic prison The Raft, a microscopic prison created by Hank Pym, and the Negative Zone prison from Civil War. Next: It’s a nice day for green wedding.